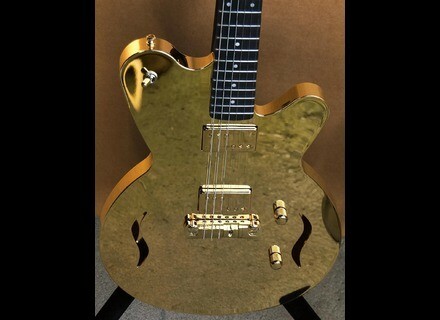 18 K gold guitar, GGG #001, Hollow Body/Semi Hollow Body Electric Guitar from Liquid Metal Guitars. The Liquid Metal Guitar Company (LMG) released its latest model of unique metal bodied guitars by shipping an 18 K gold guitar, GGG #001. "Our mandate is to build metal bodies guitars that take advantage of the exceptional sound opportunities we have found through our growing expertise, as well as, creating looks that one can only get with metal. Pure18K gold on a guitar body is just such a fulfillment of that mandate." says Phil Cook, owner of The Liquid Metal Guitar Company. "this is gold and this stunning, rich and unique." GGG #001 went to a collector who collection includes a gold bodied Veleno from back in the 60/70's. He said that he was amazed at how good GGG #001 looked, " gold guitars are a rare bird, good gold guitars are even a rarer find and this is truly amazing, in look and sound." 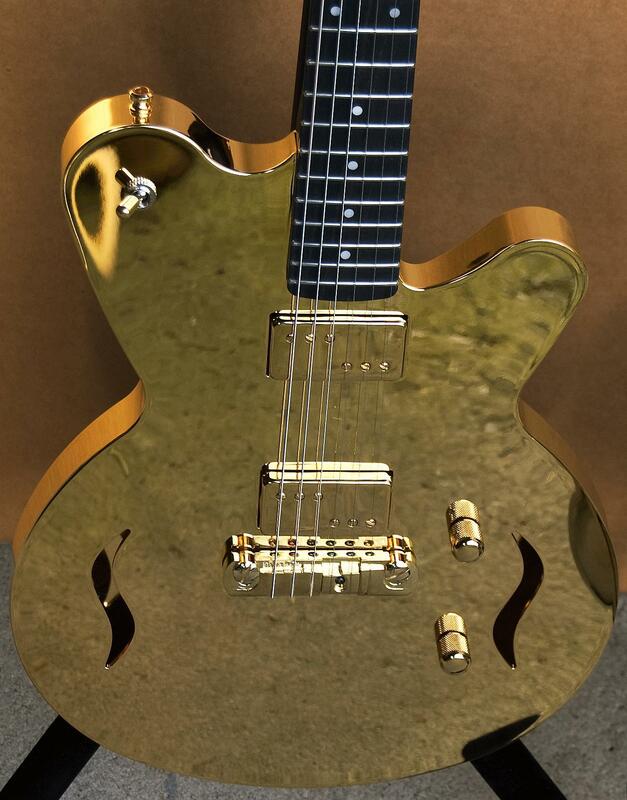 The glistening gold guitars are offered in both the M1 TV Jones special and the Hard Edge. The pickup sets specifically made by two of the best sound guys in the business make the metal bodies sing with the complex brightness of the metal. LMG guitars are not another reinterpretation in wood or plastic. It is metal — machined, hard cool metal — with soothing curves and sinful cuts, whose luminescence sizzles and shimmers as only metal can. LMG guitars are a celebration of noise and cars and rock and roll. For more information, visit their web site at www.liquidmetalguitars.com.